Texas Spur Steak Ranch is a family style restaurant with a taste for life! 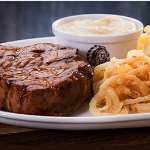 South Africa’s favourite burgers, ribs and steaks. What better than a good flame and the best,tastiest burgers that the Indian-tribe can offer you! I am yet to taste a tastier meal compared to what you guys at Spur can cook up, don't get me to your puddings and desserts, I simply love my old favorite and I'm sure favorite to many others your Waffles, simple but just right,what makes better food than better surroundings, I have to compliment you on the surrounding that you formulated and has transformed Spur restaurants into one of the best family restaurants.